Large, late season. Dark red skin, high quality even where summer nights are warm. For dessert and cooking. Keeps many months. 800 hours. Partly self-fruitful. New, from New Zealand. Superb late season fruit: very crisp and tangy, more flavorful than Granny Smith. Excellent keeper. Green with dark red blush. October-November harvest. Estimated chill time 700 hours. Self-fruitful. 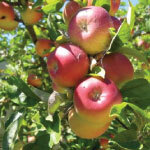 Recent introduction from Japan that quickly became California's favorite apple. Sweet, very crisp and flavorful, excellent keeper. Dull reddish-orange skin, sometimes russeted. Ripe mid-September. Excellent pollenizer for other apple varieties. Chilling requirement apparently less than 600 hours. Self fruitful. Wonderful dessert apple from New Zealand. Crisp, nice blend of sweetness and tartness, rich flavor. Skin reddish-orange over yellow. Early harvest, 2-3 weeks before Red Delicious. Good pollenizer for other varieties. 500 to 600 hours. Self fruitful. Long-time favorite for its sweetness and flavor. Reliable producer, adapted to many climates. Pollenizer for RedDelicious. Mid-season harvest (September in Central Calif.). 700 hours. Self fruitful. From Australia. Large, late, green, all-purpose. Crisp, tart, excellent keeper. Requires long summer. Thrives in hot climates. 600 hours. Prolonged bloom: good pollenizer for other apples. Self fruitful. Famous for sauce and baking, also used fresh. Crisp, juicy, flavorful, tart. Early bloom, early harvest. 700 hours. Pollen-sterile, pollenizer required: Empire, Fuji, Gala, Red Delicious. Winter hardy tree from the University of Minnesota. Fruit is crisp and juicy with an aromatic flavor. Striped red over yellow color. Stores well. Ripens from late September to late October. Hot climate apple from Western Australia. Very crisp, sweet-tart, distinct flavor, good keeper. Skin reddish-pink over green when ripe. White flesh resists browning. Harvest begins late October in Central CA, about three weeks after Fuji. Self-fruitful. 400 to 500 hours. Sweet, crisp, flavorful — Early fall. Small, compact tree. Good pollenizer for most other apples. 700 hours. Pollenized by Liberty, Granny Smith, Golden Delicious, Fuji, Gala. Redder-skinned bud sport of Fuji. Sweet, very crisp and flavorful, excellent keeper. Ripe September-October in Central Calif. Excellent pollenizer for other apple varieties. Self-fruitful. Yellow-green, late, firm, crisp, slightly tart, superb flavor. For peak flavor and acid/sugar balance, wait to harvest til cheeks are yellowish-green (late Oct./ early Nov. in Central Calif.). Good keeper. Famous for cooking, excellent fresh or dried. Vigorous tree. 700 hours. Self-fruitful.